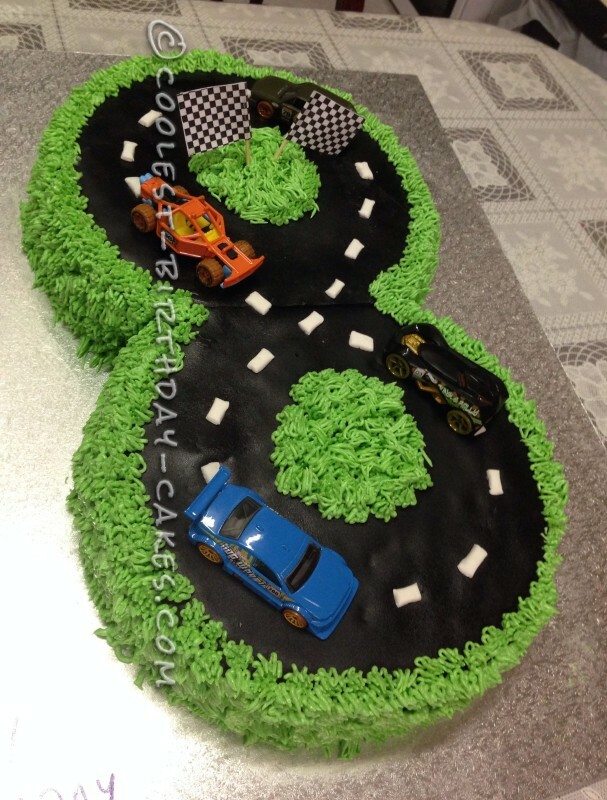 I was excited when my son turned 8! He was into racing tracks and cars. 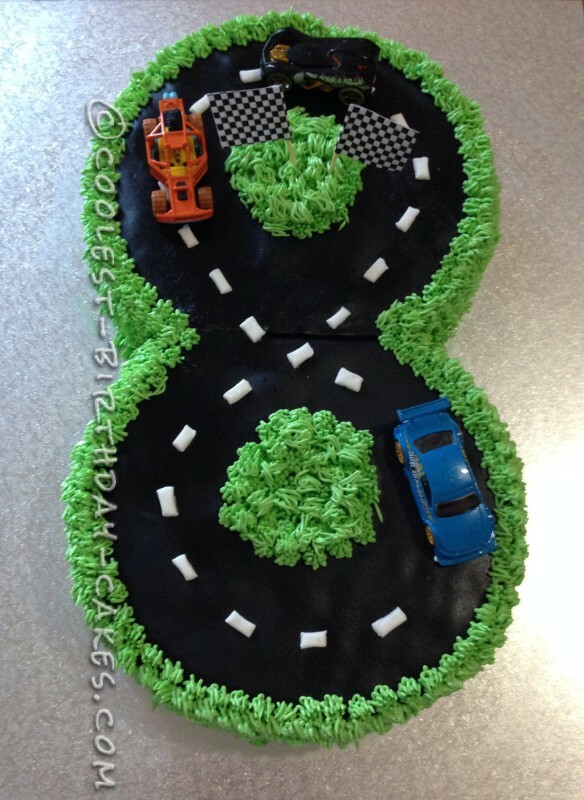 What a perfect combination for making a cake… a number 8 race track cake. I baked 2 round 20cm cakes, chocolate and caramel mud. I levelled the cakes identically, slicing the tops off. I also cut the ends of each circle so the cakes would sit flush together. These were baked the day before so once I began cutting the cakes they were cooled properly and slicing was easier. I was quite nervous decorating because I left it all for the day of the birthday. To my surprise though I managed to pull it off with a few hours to spare! I tinted buttercream icing green and coated the whole cake roughly. The track is made from fondant so I rolled it out and and used a smaller cake pan to cut two circles and cut the ends of the circles again so it sits nicely on the cake. To make the track shiny I sprayed a glaze over it. It also allowed the white lines to stick on the track. Those were also fondant. I liked the effect of proper lines so I cut them as best I could into smaller lines. The rest of the icing was piped with a nozzle with multiple holes to give it a grass effect. It looks hard but was quite easy! I started with the smaller grass on top of track and then outlined the track on the outside. Next, I began from the bottom around the cake and worked my way back up to the top outline. I have to admit, it made the cake look a lot better once it was all covered with the grass. The flags and cars make the finishing touch! The cake was a hit, from young boys to men! I was happy with the result and having a happy birthday boy made it all worth the effort!